One of my favourite local runs is an out and back 20 miler along the North Downs Way from Farnham to Guildford and back. The route follows that of the A31, known locally as the Hogs Back as it straddles a long ridge of the same name. The road also provides fantastic views of surrounding area. 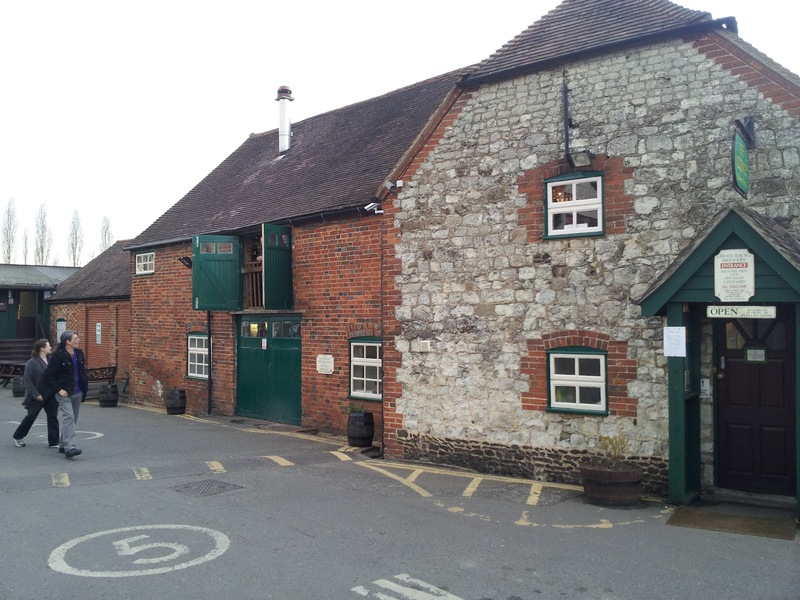 Hogs Back Brewery, founded in 1992 by Martin Zillwood-Hunt and Anthony Stanton-Precious, sits just off the A31 in Tongham. It's a very traditional brewery that prides itself on producing a consistently good core lineup alongside some varied seasonal brews. Their first brew was T.E.A. 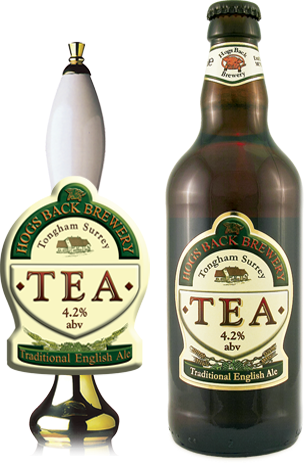 (Traditional English Ale) which is widely available both locally and further afield. It remains their flagship beer and one they're very proud of. T.E.A. has won numerous awards, including "Best Bitter in Britain", all of which are proudly displayed at the brewery. 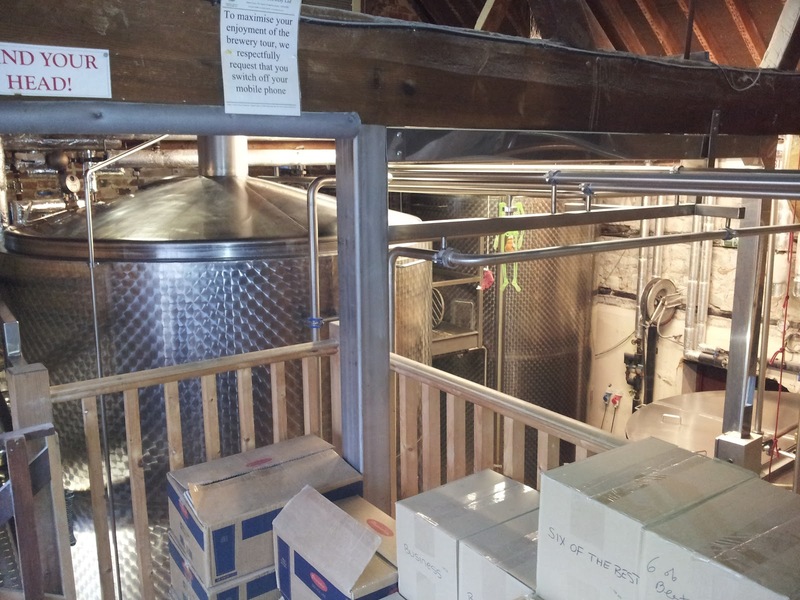 The main brewery building is a converted barn which now has two stories. It has been extended to both sides and additional buildings have been added as the brewery has grown throughout its 20 year history. 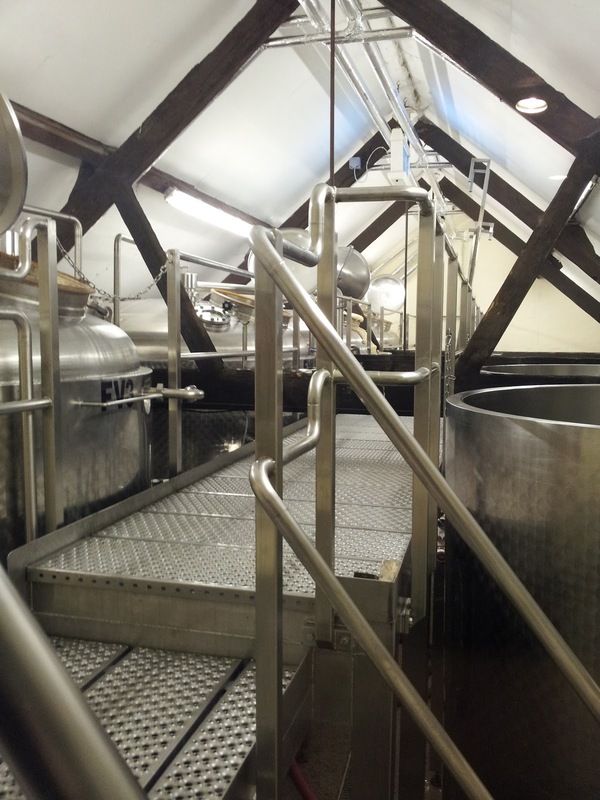 The brewery started out with 4BBL capacity but has been expanded over time to its current 40BBL capacity. Brewster Mo and her team brew five days per week, producing in excess of 50K pints at full capacity. The brewery is fully self-contained with the only offsite activity being bottling, as they simply don't have the space to bottle on site. We were booked on to the 6:30pm tour and arriving a few minutes early gave us a few minutes to look round their fantastic beer shop. As CAMRGB's Simon noted when he visited, this is a real treat. 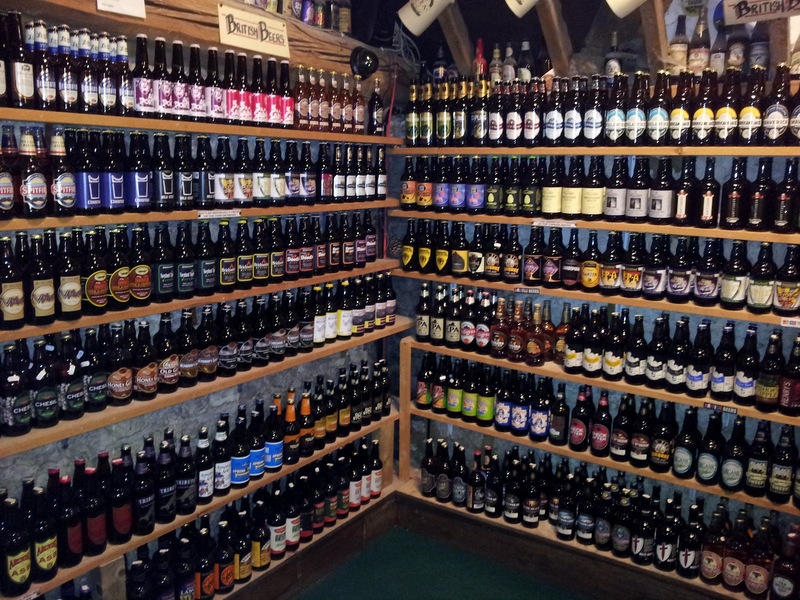 The shop stocks over 300 beers from around the world, with a strong UK emphasis. 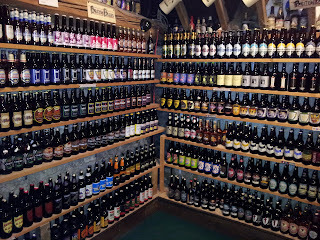 Of course, the shop also stocks the whole range of Hogs Back bottles (as seasonal availability allows) along with merchandise and other local produce including award winning sausages from A. Turner and Sons of Aldershot, who won recognition at british sausage week for sausages made with Hogs Back ales. I've visited this shop a few times and invariably end up spending a fortune there. This time I was restrained however and picked up a Bristol Beer Factory Milk Stout and a Mallinsons Hopped, both priced very reasonably. The tour started promptly in the viewing gallery (the area behind the open green double doors in the photo above) which adjoins the shop and Noel, our guide, started by telling us about the history of the local area and its role in brewing, including the history of Farnham Maltings which these days, very fittingly, is home to the annual Farnham Beerex, the longest established beer festival in the UK. The local area, which back then was mostly farm land, was a large producer of hops. Sadly, only one local producer remains. The Hampton Estate in nearby Puttenham (also the half-way point of my run) has some 14 acres of hop gardens, used to grow the Fuggles variety, a mainstay of traditional British beer styles. 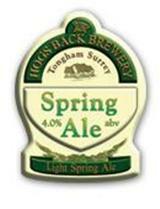 Hogs Back sources its Fuggles hops solely from this local supplier, less than three miles away. 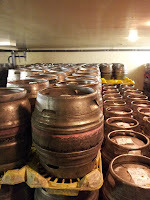 The brewery also uses the Goldings variety in its brews, although these are sourced from other parts of the South including Suffolk and Kent. Noel also talked us through the malt they use and offered us a chance to taste these (including pale, crystal and chocolate varieties) before offering us a chance to touch, feel and smell the two hop varieties as he talked about them, encouraging us to get the oil on our fingers as we tasted the first beer of the day. 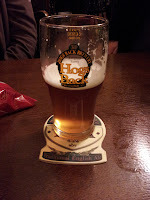 The tour includes plenty of opportunity to taste the fruits of the brewery's labour and first up was HBB (Hogs Back Bitter), a 3.7% session ale. There's no scrimping on sample sizes here. Four large jugs were on hand and half pint glasses offered to fill and refill as you wished. HBB certainly hit the spot. A backbone of biscuity malt is balanced with lovely citrus hop notes which last through to the finish. The beer was refreshing and unchallenging, as you'd expect from an easy-drinking session ales. My lager drinking Dad, who accompanied me on the tour, later declared this to be his favourite of the evening and we both refilled as Noel went on to explain the brewery's range of beers. Hogs Back makes in excess of 16 different beers throughout the year, not including one off specials such as RoyalT.E.A brewed for last year's royal wedding (look out for MajestT.E.A being released in May to commemorate the Queen's 60th Jubilee). The tour took us down (this is the area behind the lower green double doors in the top photograph) onto the brewery floor and Noel carefully explained the process of heating liquor in the HLT, adding malt, mashing in and boiling, pointing out how the wort was transferred to the kettle and a heat exchanger used for cooling. Each brew day lasts around 10 hours and starts bright and early at 6am, so the brewing team were long gone before we arrived with everything dug out, washed down and cleaned ready for the next day's brew. Our guide was also keen to point out the physical nature of the work, which had apparently surprised a few of their would-be brewery assistants down the years! The next beer was offered on the brewery floor. This was the seasonal Spring Ale. A straightforward 4.0% session ale with earthy and light malt on the nose. I got some citrus fruit and grass notes from this before the long bitter finish. 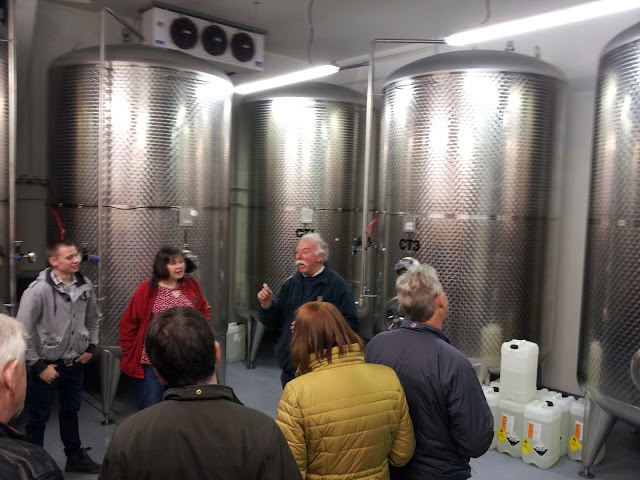 The tour then left the main building and moved into the adjacent block which houses the fermenting vessels, conditioning tanks and cellar. 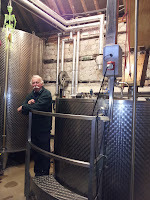 We started out in a meeting room that overlooked the fermenting vessels (below), one of which was bubbling away nicely. 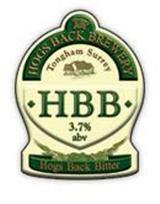 Noel explained that Hogs Back sourced its yeast from Hook Norton brewery in Oxfordshire. This was one of a few tried while developing the recipe for T.E.A. As Noel explained the process of fermenting beer from the meeting room, I was struck by the number of awards and certificates that adorned every wall, including several 'champion beer' accolades. Hogs Back is not a brewery known for experimenting with wild yeast strains, US or antipodean hop varieties or barrel ageing but what it does, it clearly does very well and the recognition it has received is there for all to see. The third beer of the evening was offered before we descended down stairs to the conditioning room. This was the brewery's flagship beer, T.E.A. at 4.2%. This is a beer I've drunk many pints of down the years. 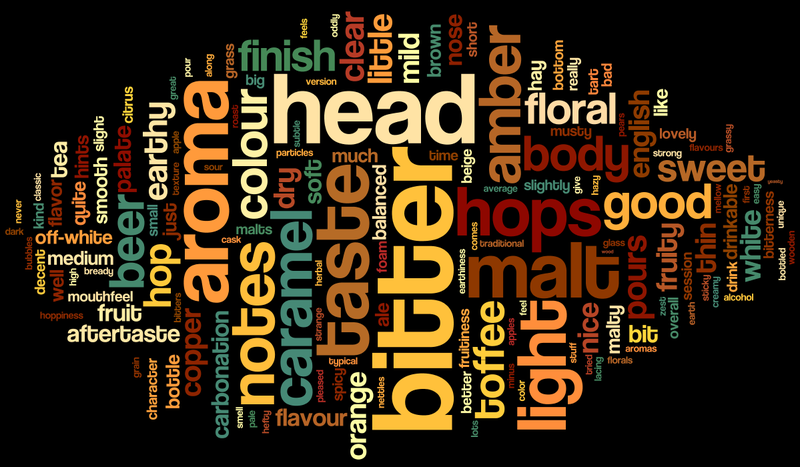 It has a bit of a following locally and is widely available both on cask and in bottle form. The sample we were offered was (perhaps understandably) fresh and perfectly conditioned. The pour is an amber colour and the nose one of dark fruits, grass and maybe a hint of cola. It may have been the conditioning but for the first time, I got some sweet fruit (blackberry-like) on the palate before the familiar caramel, grassy hops and dusting of spice. This is a beer in the classic English ale style and one I could (and have) drink a good few pints of. Regular readers will know I do love a good word cloud and below is a mash up of the 30 most recent ratebeer reviews of T.E.A. to give feel for the words most often used to describe it. We wandered down to the conditioning and cask filling room as Noel explained the use of Isinglass in the tanks to bring clarity to the beer. 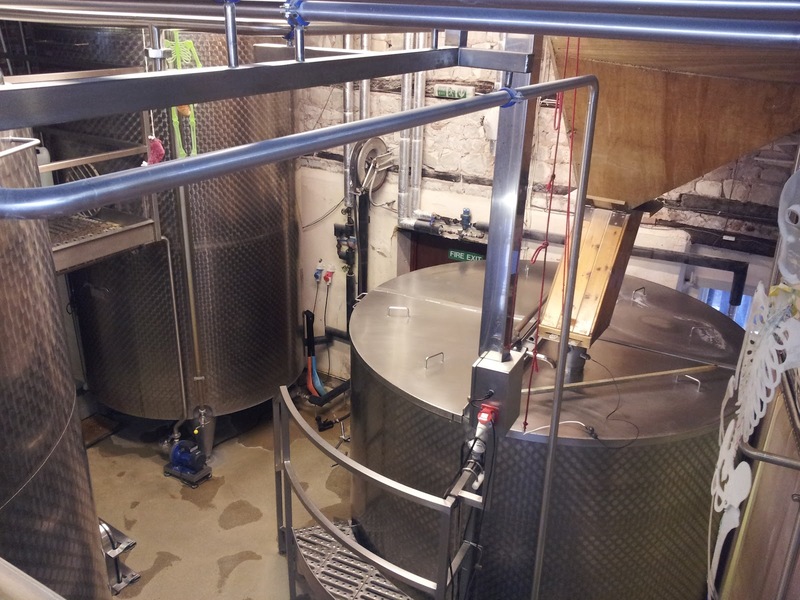 The final stop on the tour was the cellar, which was full of freshly brewed T.E.A. destined for a few local pubs I recognised from the labels on the casks and a few further afield. 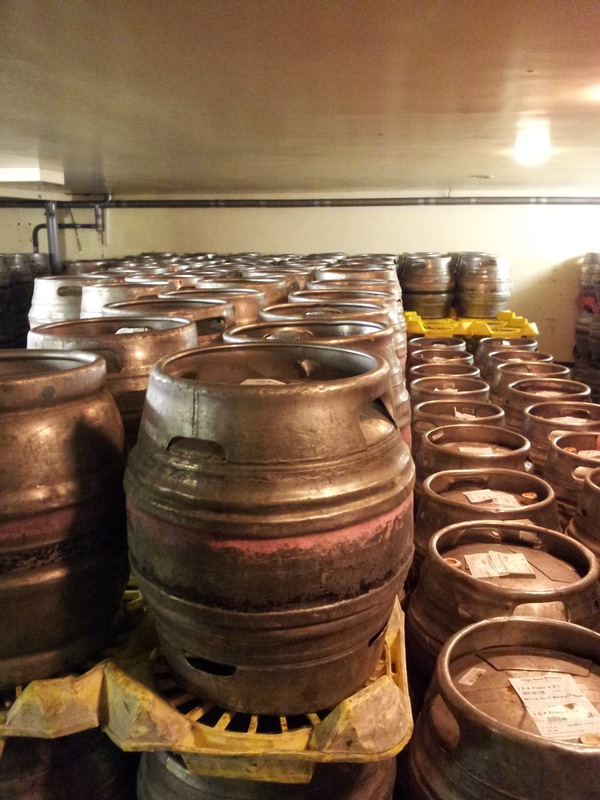 Like many breweries, Hogs Back has faced problems keeping track of their casks and lost a good few down the years, but they were apparently able to recover quite a few from a recently closed mass producer nearby! 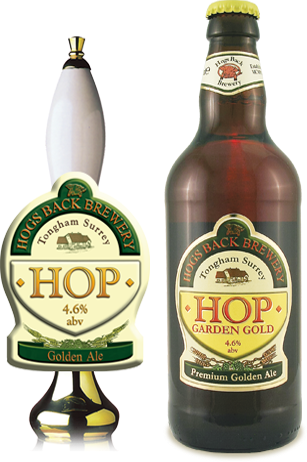 After the tour, we returned back to the shop (as all good tours do) where we were offered our final beer of the evening - Hop Garden Gold, which has recently been rebranded slightly to shorten the name to HOP on the pump clip. At 4.8% this was the strongest of the evening and the one that sparked the most debate as we tasted it. This was a golden coloured ale with a nose of pineapple, orange and distant malt biscuit notes. I found the taste to be one of malty sweetness with hints of honey and banana. This sweetness continued into the finish with a slight bitterness in coming right at the end. All four of the beers we sampled were most enjoyable but the standout for me was T.E.A. as although I'd had it many times before, it had never tasted as good as it did right there at the brewery. 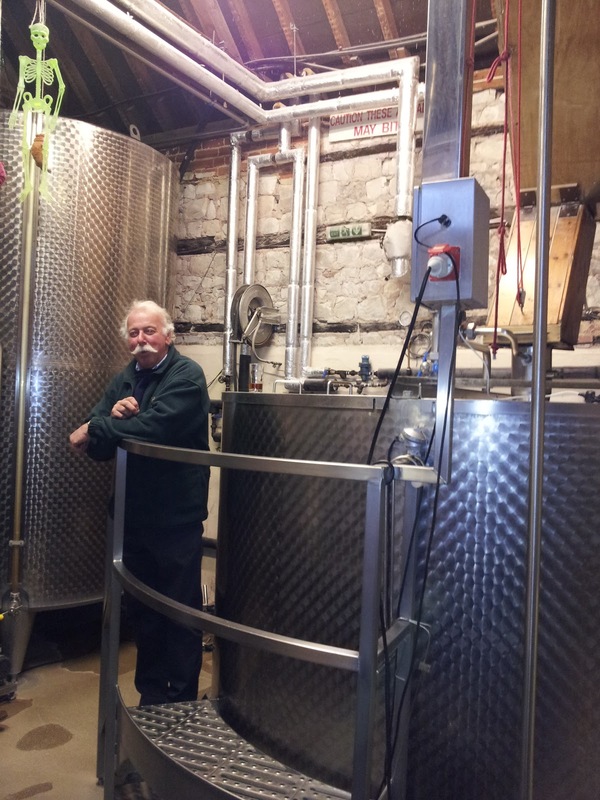 The tour was very enjoyable even for Dad, who isn't an ale drinker. Our guide was entertaining and passionate about the brewery and their beers. If you're ever in the area it's certainly worth booking on to one of the tours (evenings and weekends - check the website for details) or stopping by the fantastic shop to pick up some bottles. You certainly won't be disappointed with the huge range on offer if you've only time for the latter. We had an hour to kill before our ride home was to arrive, so we headed down to the nearby White Hart in Tongham village. The pub always has two or three Hogs Back beers on, in this case T.E.A. and HOP. A big thanks to Regional Sales Manager Dominic Ronane for booking us on to the tour.